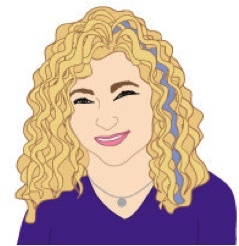 I’m delighted to have author Avery Duran on my blog tonight, the eighth night of Hanukkah, to talk about her newest book, Ahava Is Love. 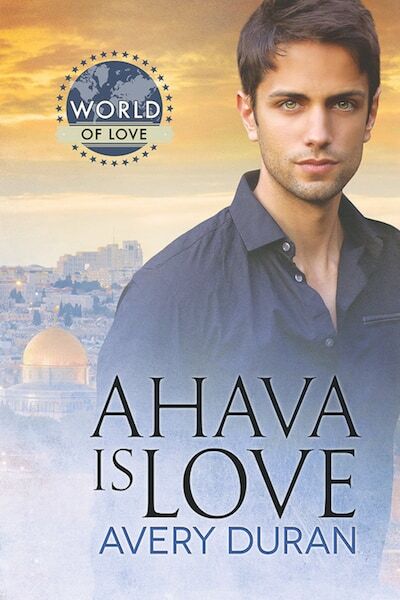 Ahava Is Love is a romance between an Israeli medic and an American real estate agent who is traveling in Israel to explore his heritage. The trip takes place in winter and happens to coincide with the eight days of Hanukkah. Have you heard of Hanukkah, but never understood what it was about? It commemorates the rededication of the Jerusalem temple around 160 BCE, after a revolt against Greek rulers who had restricted Jewish religious practices. It happens every year in November or December and lasts eight days, and is marked by lighting candles with blessings each evening. There are some fun cultural traditions tied in with the holiday. One of my favorites is the tradition of frying foods in oil to represent the lamp oil used in the temple rededication. This results in some delicious treats like latkes (potato pancakes) from Europe and sufganiyot (jelly donuts) from the Middle East. In the United States, many families—though not all—exchange gifts as well. But throughout the world, it’s more common to give children small amounts of money (or chocolate coins) to commemorate the coins that were minted after liberation from the Ancient Greeks. There’s also the dreidel game, which Avery and I chat about below. I offer all this as background. Ahava Is Love is not about Hanukkah—the festival is a backdrop to the book’s events, offering a way to mark the time and to reflect on the developing relationship between the two protagonists. Ahava Is Love is really about love, first and foremost. Note: Avery and I used different spellings for Hanukkah/Chanukah in this interview. That’s because the word is from Hebrew, which has a different alphabet than English, and there’s no standard way of writing Hebrew words in English. So go ahead and enjoy all the variations—Chanukah, Hanukah, Hannukah, and more! Ahava is Love is part of Dreamspinner’s World of Love series. Tell me how you found out about World of Love and why you wanted to write a romance set in Israel. I was looking on the Dreamspinner website and found the call for submissions to their World of Love line. I’ve enjoyed reading their States of Love line [a line of romances set in the 50 states of the US], and I thought this sounded really intriguing. The novellas in this line spotlight a specific country, while also demonstrating how universal love can be. While a strong love story is essential, the setting almost becomes a third character. I have a great love for Israel, and felt that a land with such history and faith, would be an incredible background for a love story. Your main character, Josh, is a realtor who wants a serious relationship but keeps ending up with guys who’d rather play around. He decides to take a break from the dating game and spend some time getting to know himself better. This leads him to connecting with Israeli Pilgrims, a fictional organization that sponsors free trips for young Jewish adults to visit Israel and explore their cultural and religious heritage. He signs on as a group leader to help with a trip that upcoming winter. What inspired you to send your main character on a group pilgrimage to Israel? Have you been on a similar trip? The moment I started thinking about writing for the line, the idea for this storyline popped into my head. I felt that seeing Israel though Josh’s eyes would let the reader experience Israel as he does. I know that these trips are intensely moving, so for someone who was searching for meaning in his life—the elusive key to his happiness—a trip like this would be an effective catalyst. It was important that this not just be about him falling in love with someone, he also had to learn to love himself. That was the only way any relationship with another person could be sustainable. I had the privilege of being a leader for a similar trip a number of years ago, and it was life-changing. You start as twenty-four strangers, but after traveling around a foreign country in a bus for ten days, you feel as if you have spent a lifetime together. Layer in the historical and cultural significance of the location, it is a setting ripe for love. I have stayed in contact with the Israeli tour guide I traveled with (she inspired the character Shoshana), and she was kind enough to help make sure Ahava was as accurate as possible. The trip happens to coincide with Hanukkah, which brings some nice touches to the story. It was fun to see the characters fighting over candy while playing the dreidl game. And there were also moments where they used the holiday to reflect on deeper things. Was your original plan to have this be a Hannukah story, or did that come out in the writing of it? I did not intend for Chanukah to be a theme, it happened organically as I wrote. Chanukah celebrates the rededication of the holy temple by the Maccabees, a small group of Jews who defeated the Greek army. They were only able to find enough oil to fuel the temple Menorah for one day, but it miraculously lasted for eight. In this book we have two men, both of whom are afraid to trust, to hope, who have good reason to give up on the idea of happily ever after. I couldn’t help but draw the parallel to the themes of the holiday—resilience, determination, faith, and most of all—miracles. It is also customary to play the dreidel game during Chanukah. Players are given a dreidel, a small spinning top with four Hebrew letters on the side, and some small objects. The top is spun, and depending on where it lands is how much the player has to put into or take out of the pot. I learned from reading your book that dreidels are a little different in Israel. I didn’t know that before! Hooray! I’m so glad you learned something new. Have you personally visited all the sites in Ahava Is Love? Do you have a favorite? I have been to all of them! I am a history buff, so visiting locations that I’d read about was unbelievable. It’s hard to pick a favorite, but if pushed I would go with Masada. I remember watching the miniseries Masada as a child and I was bawling by the end, the story touched me so. To be standing there, on such hallowed ground, with structures that had stood the test of time was unforgettable. In fact, I will be going back in a few years, when my middle son will have his Bar Mitzvah ceremony on Masada. The description of Ahava Is Love might make it sound like a heavy read to some readers. On his trip, Josh falls for Yaron, who is scared of being in a relationship after his previous serious boyfriend was killed in a terrorist attack. So what surprised me while reading this story was the degree of love and hope that ran throughout it. The characters decide to embrace an affirm life despite what has come before and what might come in the future. How did you manage to write such an uplifting book even though it had difficult themes? Do you think the characters’ attitude is influenced by their Jewish background? Thank you so much for saying that! Although I am a realist and fairly pragmatic in most situations, I believe that with faith (not necessarily a religious faith), we can achieve almost anything. I really wanted that to bleed through into the book. I also tried to show the lighter side of things: such as mocking Josh’s New York accent or going out dancing. Having strong supporting characters lets you see the main characters from a different point of view, and it keeps things from getting too heavy. Their Jewish background definitely influences the way Josh and Yaron each view the world, but I think it is only part of it. Each of the men lives someplace where terrorism has struck (Josh in New York City and Yaron in Israel), but the residents refuse to be intimidated. In their religion and at home, they are surrounded by examples of resilience, determination, and hope.